The marked contrast between the BBC's reporting of the deaths of Palestinian and Israeli children this past month has been an eloquent symbol of its wider failings. 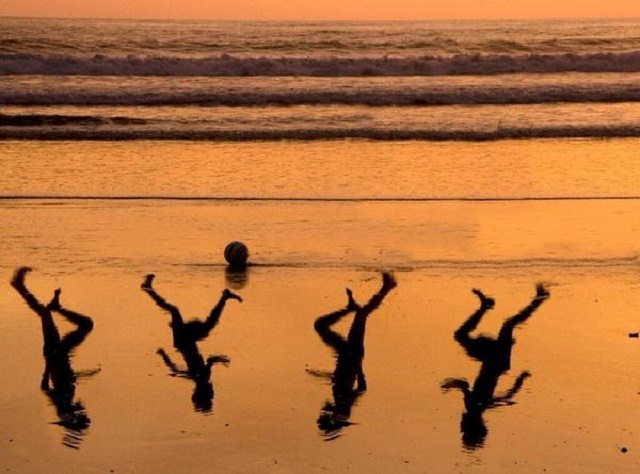 An image created by artist Amir Schiby in tribute to the four boys killed by Israeli shelling on Gaza beach this week. Last month, on June 12, three Israeli teenagers – Naftali Frenkel and Gilad Shaar, both aged 16, and 19-year-old Eyal Yifrach – were abducted and later murdered in the occupied Palestinian territories by unknown parties. As the tragic events unfolded, BBC reports on the story prominently featured the teenagers’ names, their faces and their stories. This was, above all, a tragedy on a human and personal level, the coverage correctly pointed out. No angle, however tangential, was overlooked in reporting it. When the teenagers’ bodies were discovered two weeks ago, a live update page was launched on the BBC website to report every minute-by-minute development on the reaction to their murder. Over the course of the ensuing days, further reports were produced on vigils held in their memory, as well as on the wave of national grief and fury their deaths had unleashed within Israel. Calls for revenge, including open calls for the murder of Arabs across Israeli social media and beyond, were duly answered as Israel launched a bombing campaign against the Gaza strip. Whether they liked it or not, most of Gaza’s 1.5 million civilians were being held responsible, and were about to pay, for something most of them did not condone, let alone had any hand in. Those watching the BBC’s coverage of the Israeli teenagers story could be forgiven for concluding their tragedy was the first of its kind in the region. Very few would have guessed that a Palestinian child has died at the hand of Israeli guns and bombs every three days for the past 14 years. And yet, of the more than 1500 Palestinian child deaths since 2000, few were deemed by the BBC to be worthy of even having their very names acknowledged. There were no extended video features documenting the devastation wrought upon their families and loved ones, let alone a live coverage page monitoring reactions to their killing. The stark contrast between the mainstream media’s reporting of Israeli and Palestinian deaths this month is hardly exceptional, either. 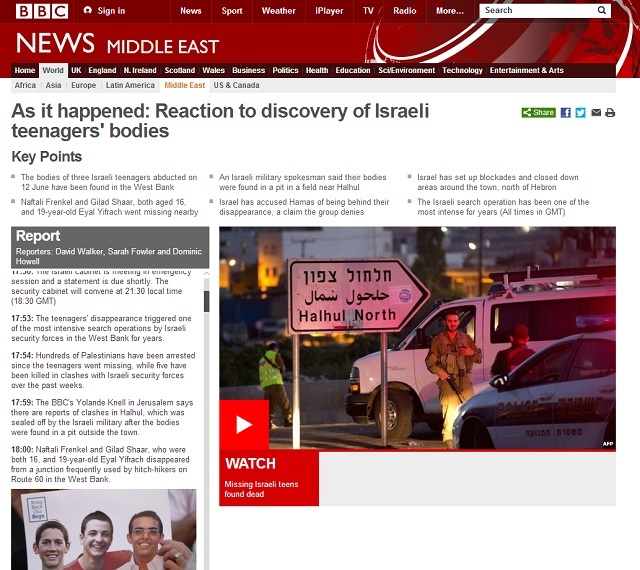 While the first Israeli casualty, recorded on Tuesday, was quickly announced within minutes as a ‘Breaking News’ ticker line on the BBC News homepage, additions to the Palestinian death toll – which has reached 232 as of 17/07 and is continually rising – have been routinely featured in BBC reports as mere statistical footnotes to the ‘real’ story: a ‘cycle of violence’ involving two equally-matched rivals ‘trading fire’, rather than a regional superpower inflicting ruthless and sadistic collective punishment on a defenceless civilian population trapped in an open air prison with nowhere to flee or hide. Yesterday, four Palestinian children playing on a Gaza beach were killed by Israeli shelling, an event witnessed by Western media reporters staying in a nearby hotel, many of whom expressed shock at what seemed a deliberate act of targeted murder. And yet, the entirety of the BBC website’s reporting of this event today comes to a single sentence: “four children were killed in an Israeli strike on a beach near Gaza City.” Unlike their Israeli counterparts, these Palestinian kids had no names, no faces, and no backstories worth bothering with. A solitary, hurried mention was all they deserved. Of course, the skewered reporting of child casualties is merely one of umpteen failings in the Middle East coverage of the BBC and other Mainstream media organisations. But it is a telling one nonetheless, because it perfectly epitomises and reflects the relentless drive by Israel and its supporters to dehumanise the Palestinians, to deprive a victimised population of its right to see its own experiences of pain, suffering and loss acknowledged as equally, if not more, valid as that of others. These attempts at dehumanisation continue, of course. When asked to explain the huge disparity in casualties between the two sides, rather than admit this to be a reflection of military disparity between occupier and occupied, Israeli spokespeople routinely prefer to invoke a sinister darkness at the heart of the collective Palestinian mind. Palestinians, we are told, are motivated by hate, whereas Israelis are driven by love. Whether by design or by accident, such racist assumptions have been internalised in much of the mainstream media coverage of the conflict. And yet, whether the BBC acknowledges it or not, every single one of those children killed by Israel yesterday had a family, a home, and a childhood’s worth of dreams, memories and mischief. Whatever the BBC seems to think, these children are not statistical abstractions and their deaths deserve more than to be ticked-off with one laconic, insipid line. Above all, these children have names: Ahed Bakr (aged 10), Zakaria Bakr (aged 10), Mohammed Bakr (aged 11), and Ismail Bakr (aged 9). You can sign this open letter which will be presented by Palestine Solidarity Campaign to the Director General of the BBC, Lord Hall. 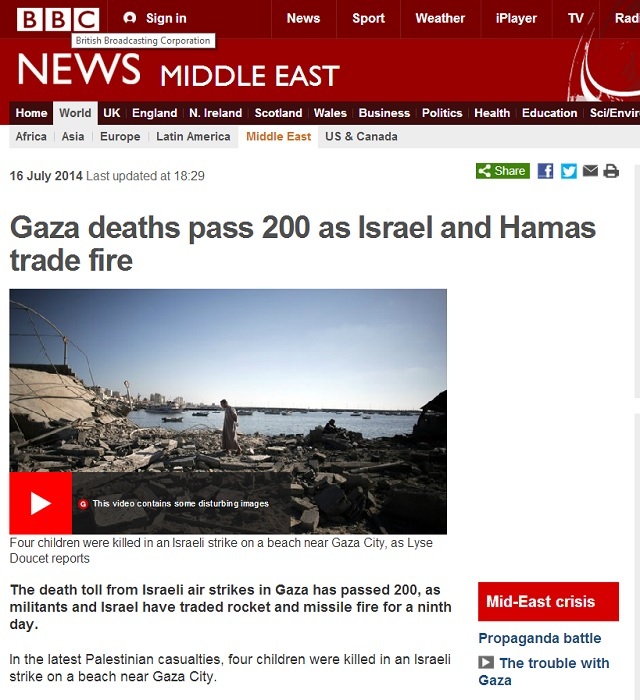 There is an evident Israeli bias in all BBC reporting of the recent events in Gaza. I would at least expect to see some ‘balance’ in the coverage of an otherwise incredibly unbalanced conflict. Thank you for this article. I only wish this article had made the BBC headlines.